See previous post for background. For a change, this post isn’t about rent-to-buy property. New: If you would like some legal information about running a similar case, send me an email (see the “about” page for my email address) or leave a comment (I won’t publish your comment) and I will send you a document by email. While a number of rent-to-buy websites respond “yes”, this question could refer to any one of many different transactions. The term “rent to buy” is used for various combinations and structures of contracts including options to purchase, tenancy agreements, terms sales and joint venture agreements. The transactions can involve intermediaries playing various roles, and use “innovative” marketing and persuasive selling techniques. The problem with ‘creative’ or ‘innovative’ strategies is that that the application of the law to the transactions may not have been tested in the courts. I’ve written previously about what can go wrong for buyers and unsuspecting sellers, and legal rights they might have. This post focuses on some risks for rent-to-buy operators which have been highlighted by the courts. Last week, the Western Australian (WA) Supreme Court foundthat two rent-to-buy operators (brother and sister) made misleading and deceptive statements and that one carried on business as an estate agent without a licence. [Commissioner for Consumer Protection -v- Susilo  WASC 50 (27 February 2014) ] The couple, touted at one time by Rick Otton as “Big Kahunas” were fined almost $30,000. Whether a statement is misleading will depend on the circumstances, so I have summarised some of the statements found to be misleading in the Susilo case and the Court’s reasons. ‘A place for you to come in and trade your unwanted property for cash. So remember we buy houses Australia wide in any area, condition or price’. Contrary to these claims, they “did not buy houses” and used option to buy or joint venture arrangements and would not exercise that option unless a purchaser was found who would enter into and exercise the option. ‘We can buy your house fast’. Any sale of a property as part of a Rent to Buy Arrangement would not be completed immediately or within a short period of time. They weren’t part of a group of real estate investors. ‘We do not charge any commissions or fees to buy your house’. The “purchasers” would not be able to own the properties without obtaining bank finance at some stage. Advertising the houses for purchase at a weekly amount was also found to be misleading, because the house could not be purchased simply with the weekly payment, but required the payment of an upfront fee, and payment of the full purchase price therefore probably requiring bank finance at some stage. The WA real estate legislation specifically states that someone must hold a licence if they act as an agent in relation to “an option to enter into a real estate transaction”, however, the Court did not specifically rely on that clause, but considered the activities engaged in more broadly (as outlined above). The Susilos entered into a joint-venture with the seller in one of the matters before the Court, and the Court included facilitating “a joint venture rent to buy arrangement” as one of the “Rent to Buy Arrangement[s]” it considered to be the “business of a real estate agent”. The Susilos appeared alongside “successful” past students (referred to by Otton as ‘Big Kahunas’) at one or more Otton seminars. It appears that Rick Otton was referring to this case, as well as his own “banning” in WA, when he made this post in November 2013 (prior to the final outcome in Susilos’ case). 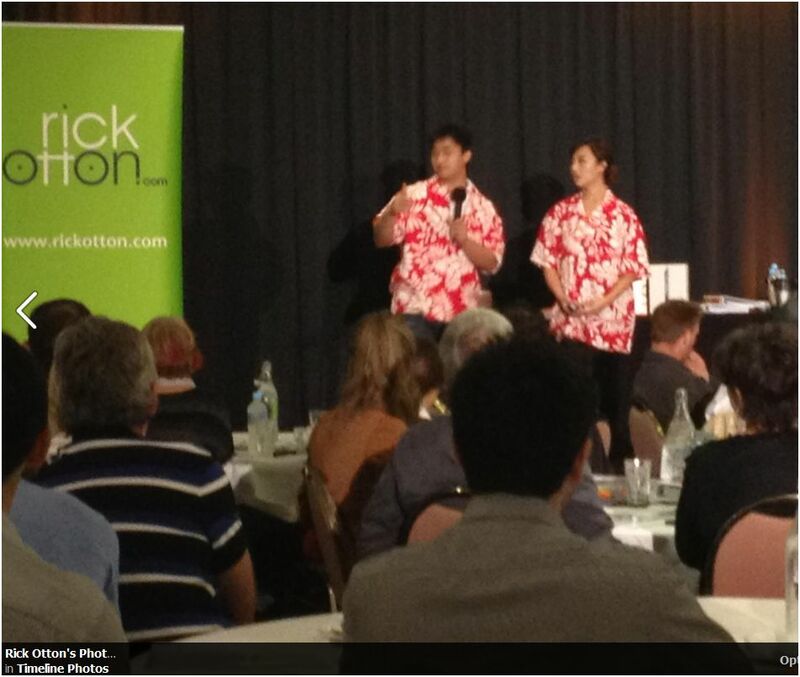 Otton expressed concerns that in WA “people need a real estate license in order buy, sell or trade a property option”. Otton bemoaned the fact that this “change” in the WA laws, “was never debated or challenged”. While Otton may have been referring to some other change that I’m unaware of, it appears that the requirement to be licensed in WA to arrange property options has been in place for at least 35 years. 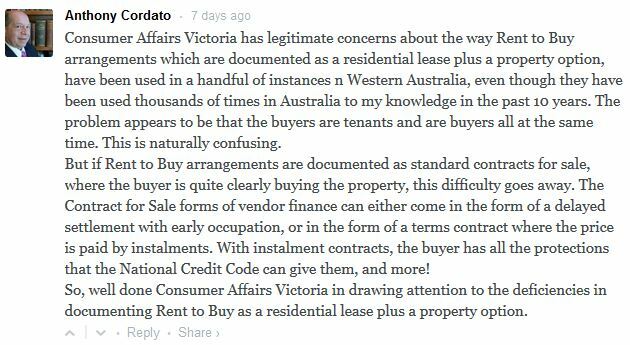 This was a somewhat different case in NSW but it also has some bearing on rent-to-buy deals. In this case there was no intermediary, it was a one-off sale and the sellers were not in the business of doing property transactions. However, the Supreme Court found that the sale on vendors terms was unjust on the basis that the price of the property was “exorbitant”, default was inevitable at the end of the contract period, that terms of the vendor finance concealed the improvidence of the transaction, and that there was exploitation by the sellers of “trust and friendship”. The sale price was $240,000 compared to evidence presented to the Court of estimated value at the time of sale of $167,500. The following is my personal opinion – I am not a lawyer. Hold a real estate agents licence, if you are doing rent-to-buy or be very confident of any legal advice that indicates you don’t need one. While the licence decision was based on WA legislation, the wording of the decision suggests that the definition of ‘real estate transaction’ in other states’ legislation would be adequate to require that rent-to-buy operators hold a real estate agent’s licence. Fix up your website, ads and signs The Court relied on the Australian Consumer Law (Commonwealth) in finding the various statements to be misleading, so it is likely that similar statements would be found to be misleading in all other states. While there could be prosecutions in other states for conduct over prior years, it’s better to comply late than never. While there is an extensive list available from this case, the general approach should also be used as a guide to other statements that might be found to be misleading. There are many rent-to-buy operators making similar claims to those made by the Susilos. “No bank”, “buy my house” “we buy houses” “we buy houses fast” and “own this home, no bank, $600pw” are found in photos of Rick Otton seminars and in his book “How to Buy a House for $1”. All these statements could be true of course, depending on the circumstances. However, if you don’t own the house, aren’t offering to buy a house outright, or aren’t genuinely offering finance where no mainstream loan will ever be required, the Court says they are misleading. Google results for these statements. Of course they don’t have time to issue proceedings against everyone, but businesses, and seminar presenters, are on notice. The Supreme Court accepted the Susilos’ evidence that they followed what they were taught at courses, including the advertising, and that the Susilos had paid the presenter $1,000 per month for ongoing mentoring and support. The Court accepted that the Susilos didn’t believe their statements were misleading, but whether or not a person intended to act illegally has little bearing in these cases. Unjust contracts: The decision relating to the exorbitant house price was based on the NSW Contracts Review Act. However, this legislation contains similar provisions to the unjust provisions in the NCCP. While purchasers in the same position in another state may not obtain a similar outcome from a deal which is not in the course of business, similar provisions of the NCCP may apply if a party is in the business of providing credit, or holds a credit licence. Reference to other court and tribunal cases involving rent-to-buy can be found here.